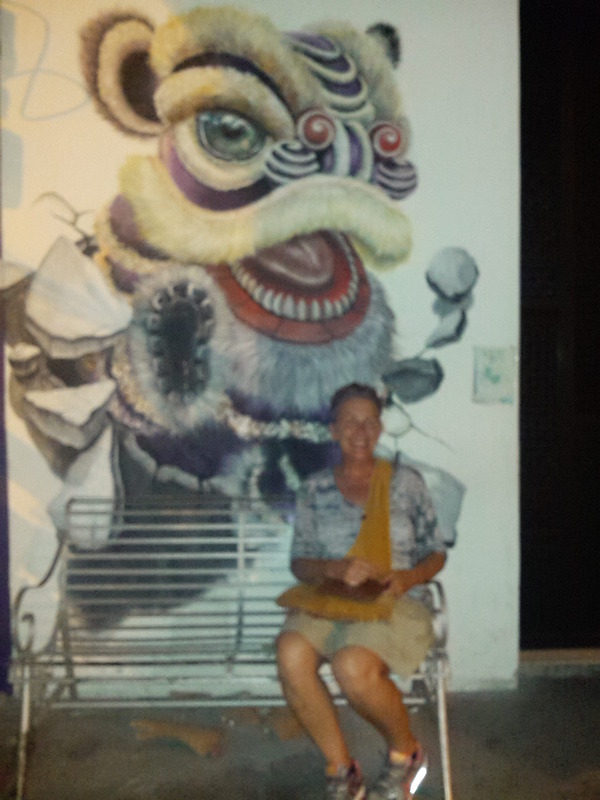 Here are a few other photos from our last day in Penang. I’ll keep the descriptions to a minimum. 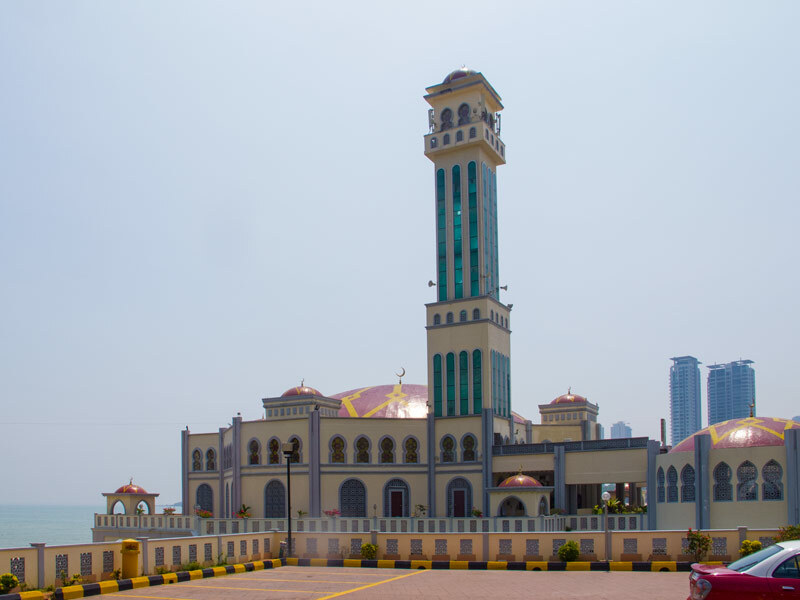 The so-called Floating Mosque. It’s a mosque built upon pillars so that it is over the water. 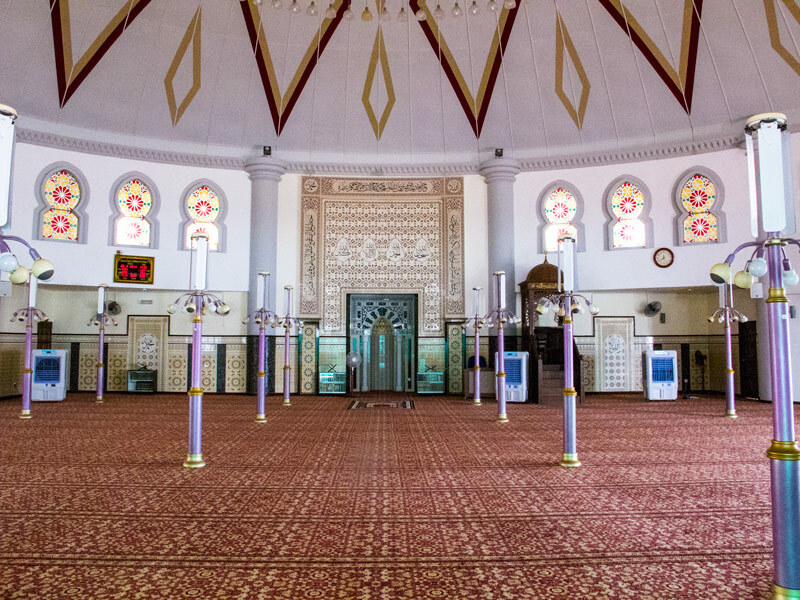 The caretakers were open to visitors, and, consequently, this was the first mosque in which I had entered the prayer room (which follows). 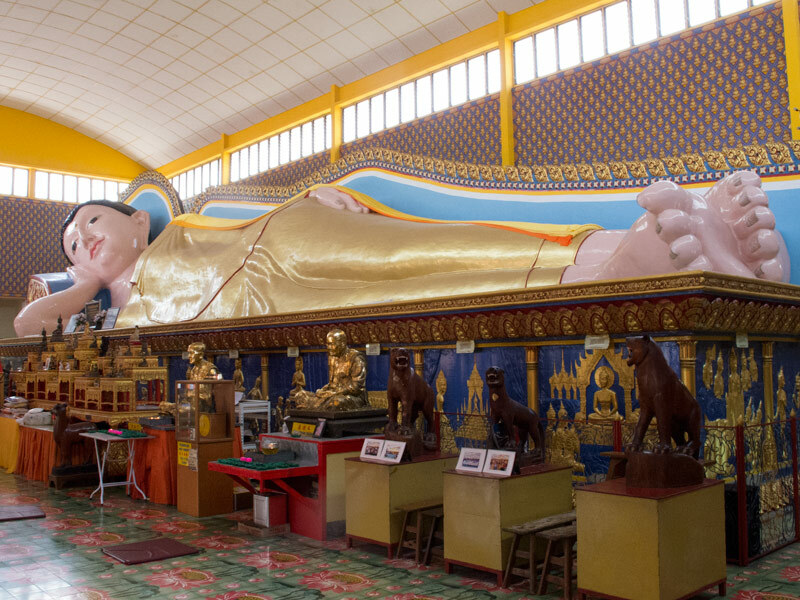 Reclining Buddha (Thai Buddhist temple). The most interesting thing about this building (other than the giant Buddha) was that it also served as a mausoleum. Thousands of urns with ashes line the four walls and the room beneath the Buddha. Thai Buddhist monks asking Kate for money. 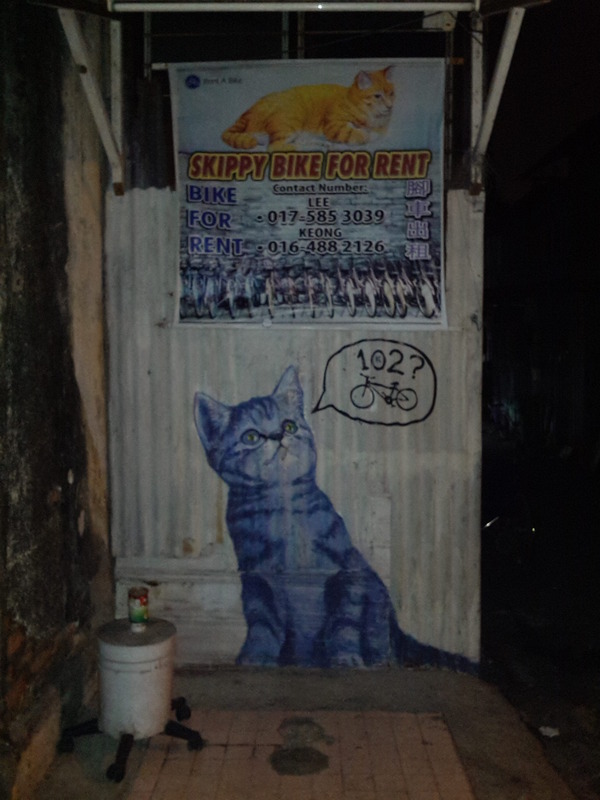 Street art photo from the evening before. 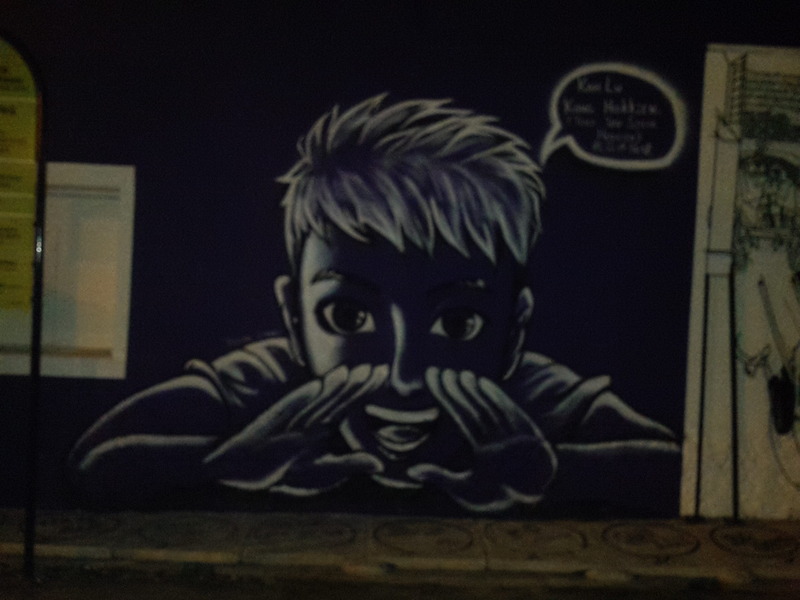 Taken with a flash at night, but enhanced in Photoshop. 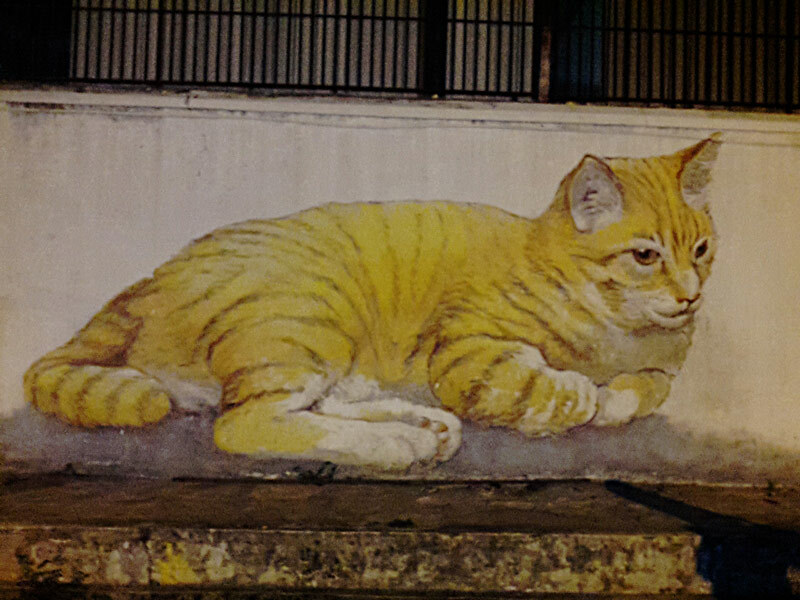 You may notice in the post done a few days before that the other artist was playing off this image in his piece of street art. I saw many different religious buildings while in Penang. The one that I thought was particularly interesting was the Burmese Buddhist temple. 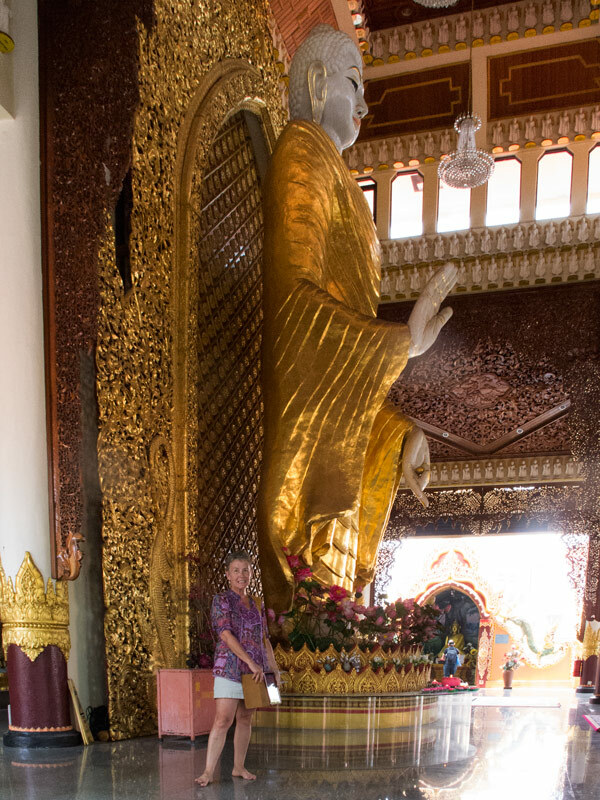 Here’s a photo of one of he main Buddhas with Kate in the photo to show scale. The first thing that stood out was the fact that the temple was instructive to the visitor. Many painted panels showed the story of the Buddha through his many trials and spiritual accomplishments. This was starkly different from all of the other religious buildings which had no such instruction. Not only did you have the painting, but there was a descriptive title plaque. Sort of like stained glass that you see in churches that tell Christ’s story, only with descriptions. The second thing was its global approach. In many parts of the temple complex there were Buddhas or plaques representing the countries of the world where Burmese Buddhism (or maybe just Buddhism) is primarily practiced. Definitely a feeling of inclusiveness even though most countries went unrepresented. Again, this was a stark contrast to the other religious buildings. Lastly, there were practicing monks that would give one a blessing. 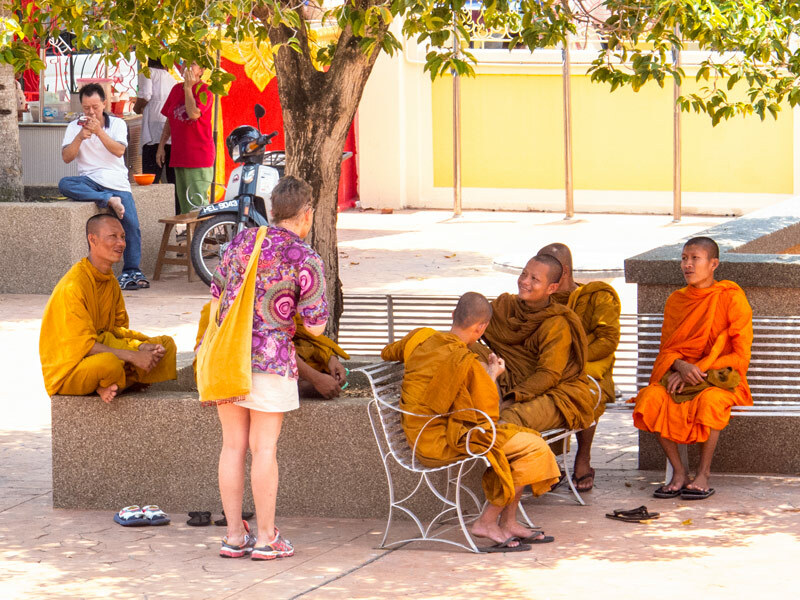 At the Thai Buddhist temple across the street, the monks asked for money. 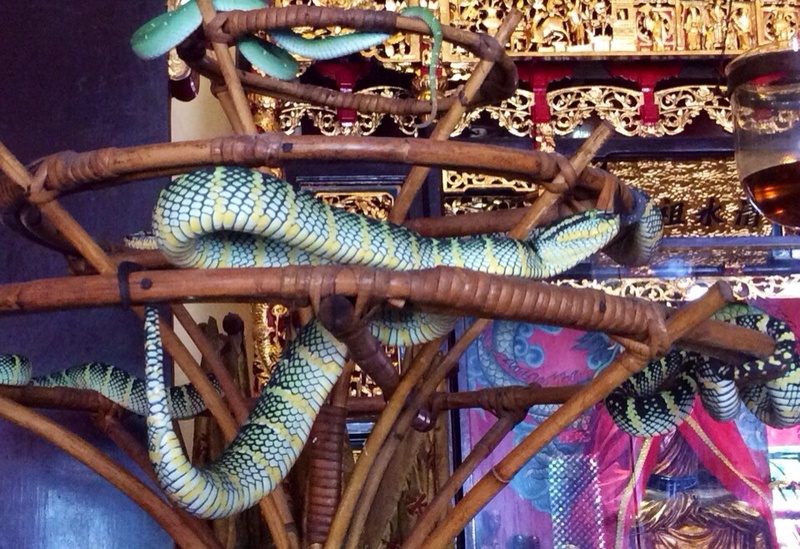 In the Chinese Buddhist temples, there was considerable commerce going on with candles and incense for sale. At the Burmese place, the gift shop was down the hall and off to the side. You get the idea. 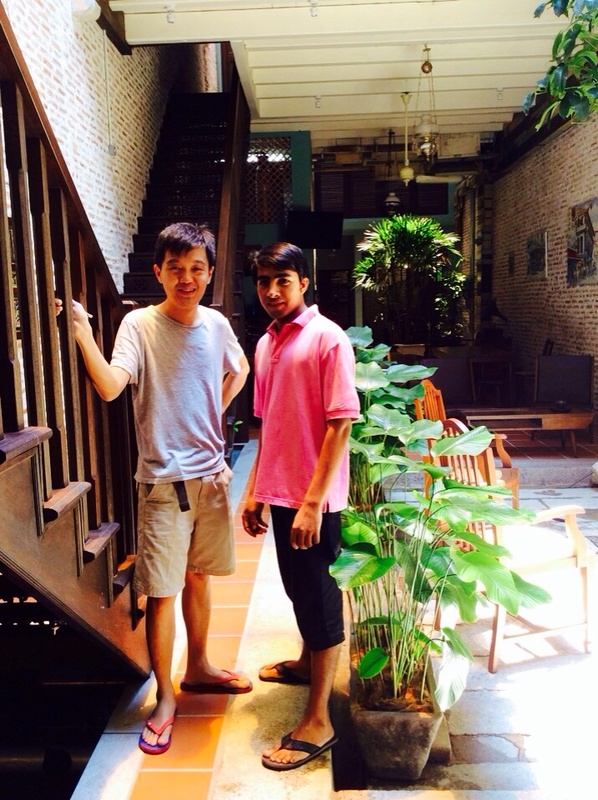 Our first night in Penang was spent at a great guesthouse (read bed and breakfast) by the name of You Le Yuen. It is operated by a young Dell-computer-guy-turned-entrepreneur owner. Leong See Kit has sought to develop a four bedroom guesthouse centrally located in the best part of Georgetown in Penang. It is a bit more expensive than the budget places, but it is worth the stay. The house is spacious, the rooms are big, and he is a wealth of info. Upon finding out about our interest in great, but not necessarily expensive dining, he recommended Line Clear, a Muslim Indian place serving Nasi Kandar (a style of dish which I will let you Google if interested). Just to let you know about the quality of the recommendation, this was a place that Anthony Bourdain featured on one of his shows. He also gave other great recommendations for food as well. Anyway, the amenities were great, the ac was cold, and the location was awesome. Located at 7 Love Lane, one could head a few blocks to churches, temples, and museums in one direction, or to food, mansions, and other museums in the other direction. Mr. Leong’s English is excellent, and he is smart (and he even visited Dell’s Round rock headquarters), and so he understood the sorts of experiences we were looking for and could direct us for a maximum experience during our stay of less than a week. 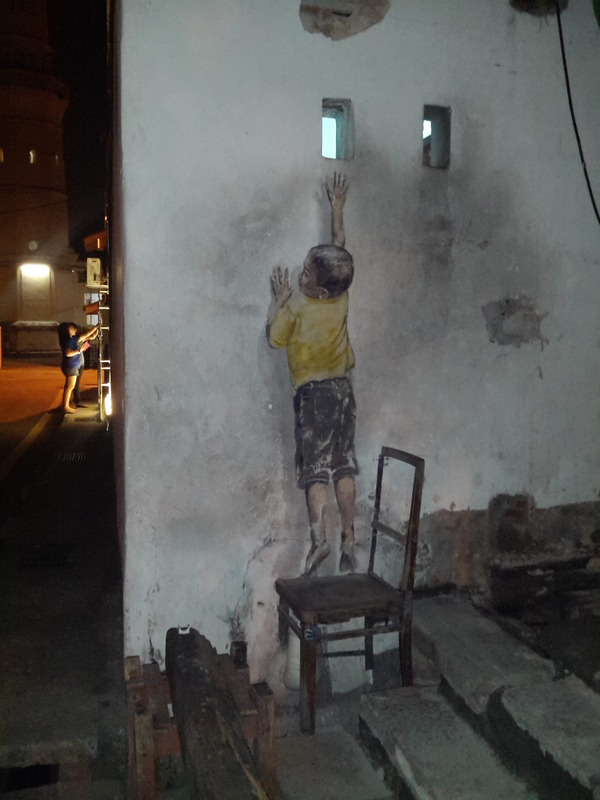 Here are a few photos from the evening walk on which we looked at street art. This morning we visit the Blue Mansion; home of a Chinese gentleman who as a child, did not speak until he was eight years old. When he began to talk, he informed his father he would be a wealthy businessman (or so the myth goes). He married into a wealthy Indonesian family, and from that he had the platform from which to prosper. 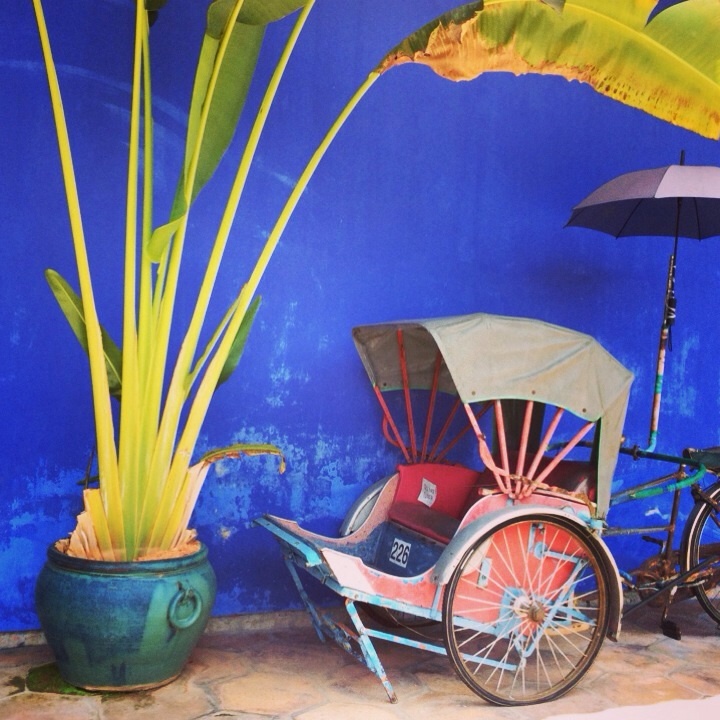 A rickshaw (pre-bicycle era) adorns the front porch. Now they are called trishaws because of the three wheels. 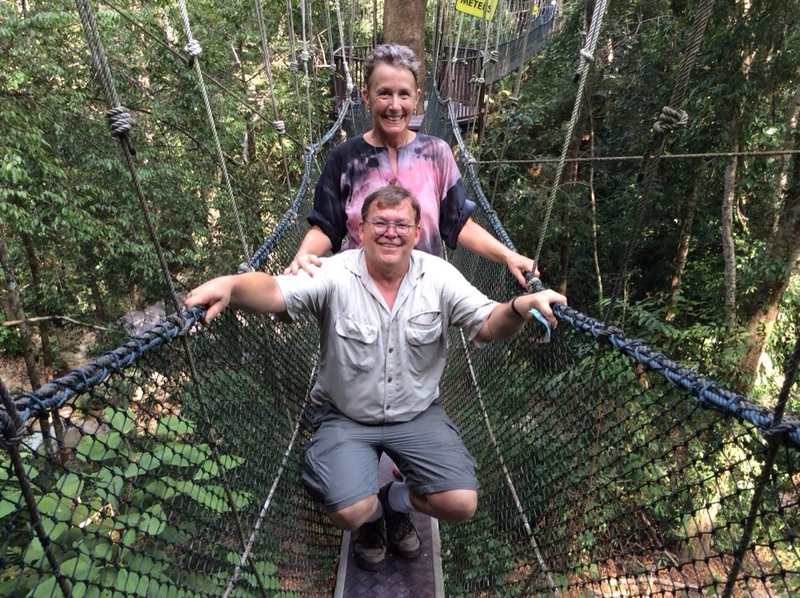 Today we went over to the Penang Butterfly Farm which was near the Penang National Park. The butterfly park was nice and we got to see all sorts of insects including a live Atlas moth that was probably 10 inches across. 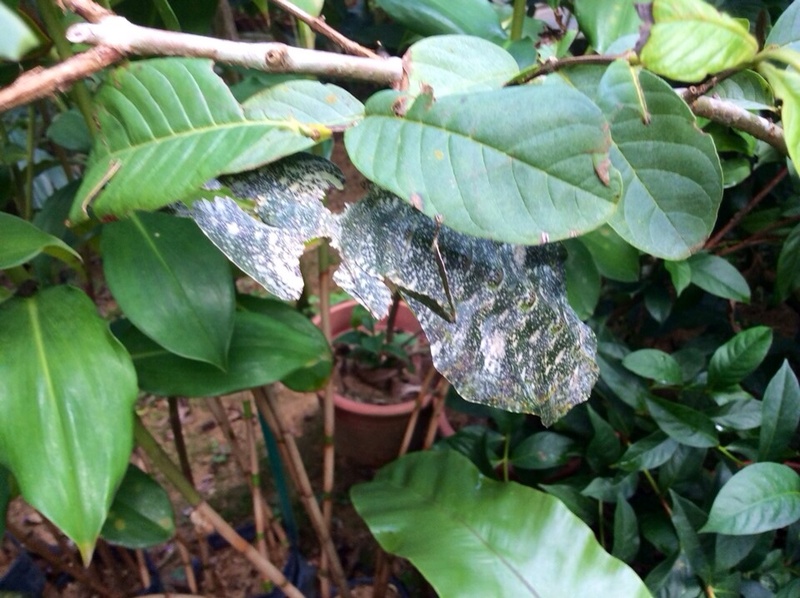 Below is a Malaysian leaf insect that mimics a leaf with nasty mold growing on it. It rests quite still during the day so it does not attract any birds. Afterwards we went for a hike in the park, and took the canopy tour, which was brief and we did not see anything up in the canopy, but it was fun. 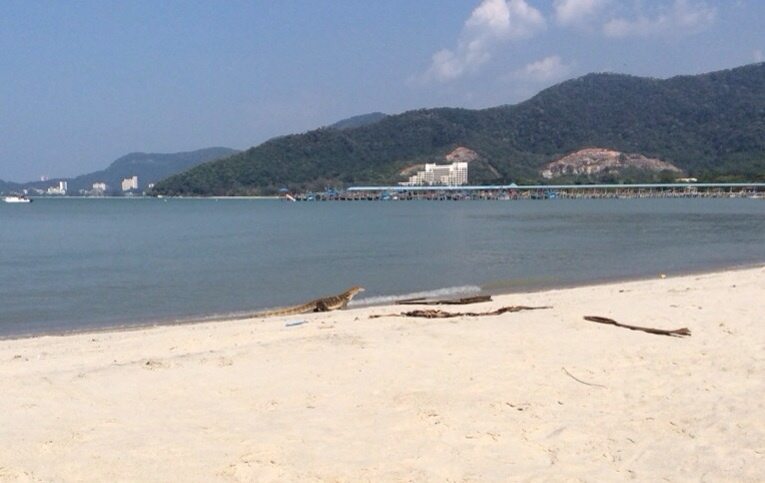 On the way back, we spotted a monitor lizard on the beach. This was no chameleon, or even iquana-sized reptile. It was 6 feet long and not particularly afraid of any of the people. It was munching on a dead fish on the shore. 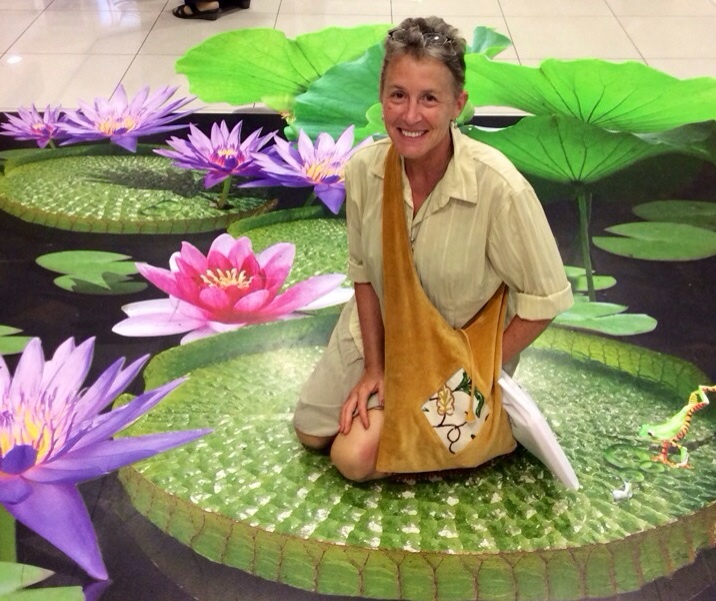 In the evening, we went out shopping, and in the mall, there was a 3d painting on the floor where you could snap a photo.